Posterolateral rotatory instability (PLRI) of the elbow was first described in 1991 by O’Driscoll et al. as a condition that is part of a spectrum of instability caused by persistent insufficiency of the lateral collateral ligament (LCL) complex, most notably the lateral ulnar collateral ligament (LUCL). In 2008, Charalambous et al. reported,“PLRI is the most common type of symptomatic chronic instability of the elbow.” In PLRI, the proximal radius and ulna externally rotate together as a unit in relation to the humerus (Figure 1), causing posterior subluxation or dislocation of the radial head relative to the capitellum, without associated instability of the proximal radioulnar joint. The LCL, radial head and coronoid process, and the common extensor origin all help prevent posterolateral laxity of the elbow. If a patient is deficient in one or more of these key supporting structures, they may be predisposed to PLRI. Ligamentous constraints: Injury to or laxity of the LUCL was initially thought to be the cause of PLRI, described by O’Driscoll in 1991 as the “critical portion of the ligament complex securing the ulna to the humerus” which helps prevent PLRI. However, in more recent research, the entire LCL complex and the surrounding tissues has been deemed responsible for contributing varus joint stability, limiting external rotation of the radius and ulna on the humerus, and preventing PLRI. 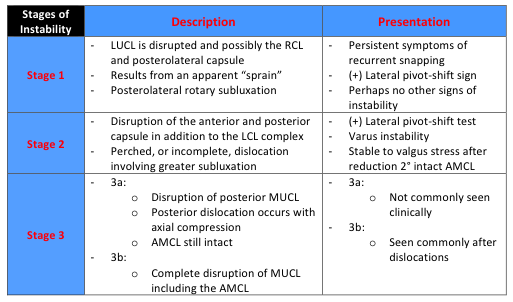 The LCL complex is comprised of the RCL, LUCL and annular ligament (Figure 2). 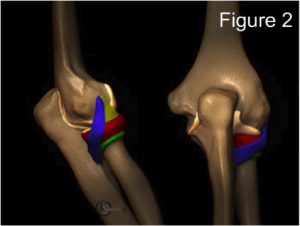 In PLRI, the annular ligament usually remains intact as the proximal radioulnar joint does not dislocate. Osseous constraints: The most fundamental element of stability in the elbow is attributed to the bony structure. The radial head has been recognized as an important secondary elbow stabilizer due to the osseous congruency it contributes to the joint and the tension it provides to the LCL complex. Researchers have also recognized the coronoid process of the ulna as an important elbow stabilizer. The coronoid process helps to prevent posterior displacement of the ulna on the humerus during axial and varus loading. Muscular constraints: Muscular forces across the elbow joint enhance elbow stability and limit PLRI. The brachialis, biceps, and triceps increase osseous stability as they compress the joint and assist with varus and valgus stability. The common wrist extensors also have been shown to substantially enhance stability of the lateral elbow. 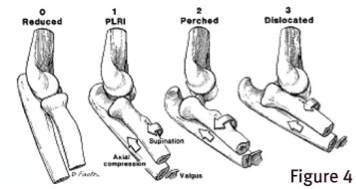 Any condition that disrupts the LCL complex can predispose the elbow to PLRI. LCL disruption most commonly results from trauma causing elbow subluxation or dislocation. Additionally, attritional laxity or attenuation of the LCL, or iatrogenic and surgical issues may also lead to PLRI. 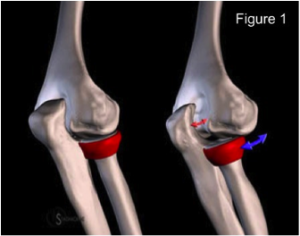 In 75% of patients younger than 20 years old, PLRI is the result of an elbow dislocation that injures the LCL complex. In adults, PLRI is more commonly caused by a varus extension stress to the elbow without dislocation, often initially diagnosed as a sprain. Figure 3. The humerus internally rotates with respect to the fixed forearm and a valgus or external rotation force is imparted to the elbow. 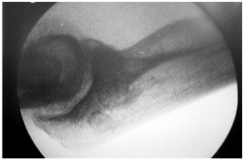 Image from: O’Driscoll SW, Morrey BF, Korinek S, An K-N. Elbow subluxation and dislocation: a spectrum of instability. Clinical Orthopaedics and Related Research. 1992;280:186-197. Trauma/Dislocation: Elbow dislocations or subluxations are usually the result of a fall on the outstretched hand (FOOSH). Typically, a person will fall onto a slightly flexed elbow and pronated forearm as the hand initially contacts the ground. Then the humerus internally rotates with respect to the fixed forearm and a valgus or external rotation force is imparted to the elbow (Figure 3). This order of events will most commonly result in PLRI. Traumatic disruption of soft tissue generally starts with the LCL and progresses in a circular fashion, laterally to medially, as described by O’Driscoll’s spectrum of instability (Table 1) (Figure 4). The LCL is almost always disrupted in elbow dislocations from a traumatic fall. Elbow dislocations are estimated to occur in 6/100,000 people and are the most common cause of ligamentous injury that result in instability. Of those dislocations, greater than 95% occur in a posterolateral direction. After dislocation, about 15 – 35% of people will experience a recurrence of instability. Laxity/Attenuation of the LCL: Attritional laxity of the LCL can occur with chronic soft tissue overload. An example of this can be seen in elbows with a cubitus varus deformity which can be caused after malunion of a supracondylar humeral fracture in children. LCL insufficiency has also been reported in patients with lateral epicondylitis who received repetitive corticosteroid injections. PLRI may also be seen in patients that require long-term upper extremity weight bearing through an assistive device. Patients with connective tissue disorders such as Ehlers-Danlos syndrome have also been noted to develop PLRI. Iatrogenic/Surgical Causes: Intensive debridement or an over-aggressive lateral epicondyle release for patients with lateral epicondylitis may cause iatrogenic PLRI. Surgical procedures such as a radial head resection and other surgical approaches to the lateral side of the elbow joint have also been noted to predispose patients to PLRI. Table 1. Instability Spectrum. 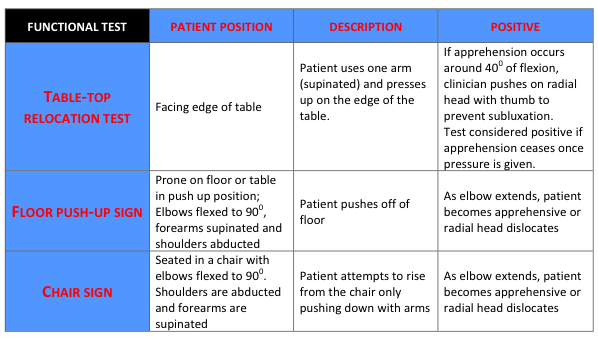 Table adapted from: O’Driscoll SW, Morrey BF, Korinek S, An K-N. Elbow subluxation and dislocation: a spectrum of instability. Clinical Orthopaedics and Related Research. 1992;280:186-197. Figure 4. Spectrum of instability from subluxation to dislocation. Image from: O’Driscoll SWM. Elbow instability. Acta Orthopaedica Belgica. 1999;65(4):404-415. Patients with PLRI may present with a spectrum of different symptoms ranging from vague pain in the elbow to recurrent posterolateral dislocations. The most common patient complaints/symptoms are recurrent popping, clicking, clunking, or locking, accompanied by a sense of instability in the elbow. These symptoms occur during the act of extension and supination, especially when an axial load is applied through the upper extremity. Other symptoms consist of subluxation, a sense of weakness, and functional disability. Recurrent complete dislocations are rare. Pushing down with the upper extremity to rise from a seated position, performing press-up/push-up exercises, and pushing heavy objects with an extended arm are common activities that patients with PLRI report that reproduce their symptoms. Acutely misdiagnosed as a simple sprain when in fact, PLRI exists. When lateral epicondylitis does not respond to conservative treatment it is often times the result an underlying LUCL injury. With MRI, LUCL abnormalities have been found in up to 63% of patients with lateral epicondylitis. Supine with arm overhead. Elbow is flexed to 400. Clinician applies an anterior to posterior force to the radial and ulna with the forearm in external rotation. Patient is in a seated position with elbow flexed slightly and clinician gives a posterolateral drawer and supination force to the proximal forearm. The test is done at 300 and 900 of elbow flexion. Clinician stabilizes the humerus and gives a superior and inferior force to the forearm. After an acute dislocation, it is important to remember to do a thorough neurovascular examination before and after reduction of the joint. The wrist and shoulder should also be examined for associated upper extremity injury. Figure 7. Flouroscan of elbow with provocative lateral stress showing radial head subluxation posterior to midline of capitellum. Image from: Cheng C-Y. Long-term sequel of posterolateral rotatory instability of the elbow: a case report. Journal of Orthopaedic Surgery and Research. 2010;5(5):1-5. For patients with PLRI, plain radiographs usually appear normal. Fluoroscopic evaluation performed during a pivot shift test is the preferable imaging method for diagnosing PLRI (Figure 7). Gravity-assisted stress radiographs also frequently demonstrate posterolateral instability. The use of MRI to confirm a tear of the LUCL can be complex and even unreliable. Surgery is often indicated for PLRI, especially when conservative treatment is unsuccessful. If the lateral ligament complex is suspected to be injured after an acute injury, stabilization of the elbow in pronation with a hinged brace should be implemented for 4-6 weeks. The aim of bracing is to limit valgus loading and supination. For patients who are able to modify their activities, surgery may not be necessary. However, for most patients with recurrent instability or those who have persistent symptoms, surgery is the treatment of choice. This is especially true when conservative treatment has failed to address pain and functional limitations. Time alone will not restabilize an incompetent LUCL. Surgery aims to reconstruct the LUCL, thereby restoring rotational stability to the humeroulnar joint. A review of the literature shows that the vast majority of the time, surgical treatment has proven to provide successful results. Patients who sustain PLRI through trauma tend to have better outcomes after surgery. The type of surgery depends on the underlying pathology. 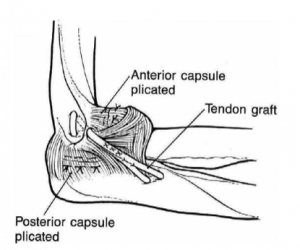 Most often, a tendon graft is used to reconstruct the incompetent lateral ligaments. This type of reconstruction has consistently provided better results than a ligamentous repair. Arthroscopy is the alternative. Figure 8. Open reconstruction: Graft Placement. Image from: Savoie FH, Field LD, Ramsey JR. Posterolateral rotatory instability of the elbow: diagnosis and management. Oper Tech Sports Med. 2006;14:81-85. Open graft reconstruction technique: Most often, a graft from the palmaris or plantaris tendon is attached to the posterolateral aspect of the epiondyle and is passed through bone tunnels to the supinator crest of the ulna (Figure 8). The aconeus is first swept posteriorly to allow placement of the bone tunnels. Muscles whose origins may be reflected during ligamentous repair include those of the common extensor origin. To avoid multiple incision sites, Olsen suggests using a triceps tendon graft, which has proven to be reliable in stabilizing the elbow, preventing movement deficits, and eliminating pain. This technique also allows for an accelerated rehab program. Arthroscopic Surgical Technique: Sutures are used to plicate the lateral ligament complex and are then tied over or under the anconeus muscle. The entire complex is then sutured to the humerus. The immobilization period after surgery varies depending on the technique. Most often, the elbow is positioned in 90 degrees of flexion and full pronation and is immobilized in a splint for 7 days to 2 weeks. The splint is then replaced with a hinged brace with a 30 degree extension block (Figure 9). 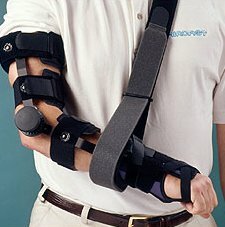 Active assisted range of motion exercises are performed for the first six weeks, and at this point, the hinged brace is unlocked. The forearm remains in pronation for flexion and extension exercises. 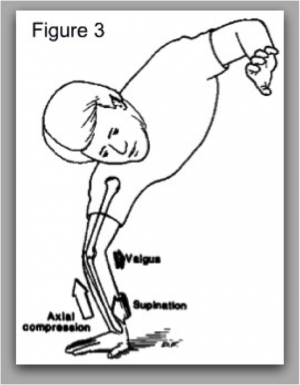 Supination and pronation exercises are done with the elbow at 90 degrees of flexion. These exercises are continued after the brace is unlocked, and are progressed to flexion and extension in neutral and eventually in supination. After 8 weeks, strengthening can begin, but may begin in as little as one week, depending on the surgeon and technique used. The brace is then removed between 8 and 12 weeks. Activity is no longer limited after four to six months, but varus stresses should be avoided. Evidence for non-surgical management of PLRI is scarce. Goals of treatment include patient education to avoid unstable positions of the arm, as well as motion restoration without compromising the stability of the elbow. Much like treatment post surgery, immobilization after reduction in full pronation and 90-120 degrees of elbow flexion is encouraged to promote stability and restrict destabilizing forces on the elbow. 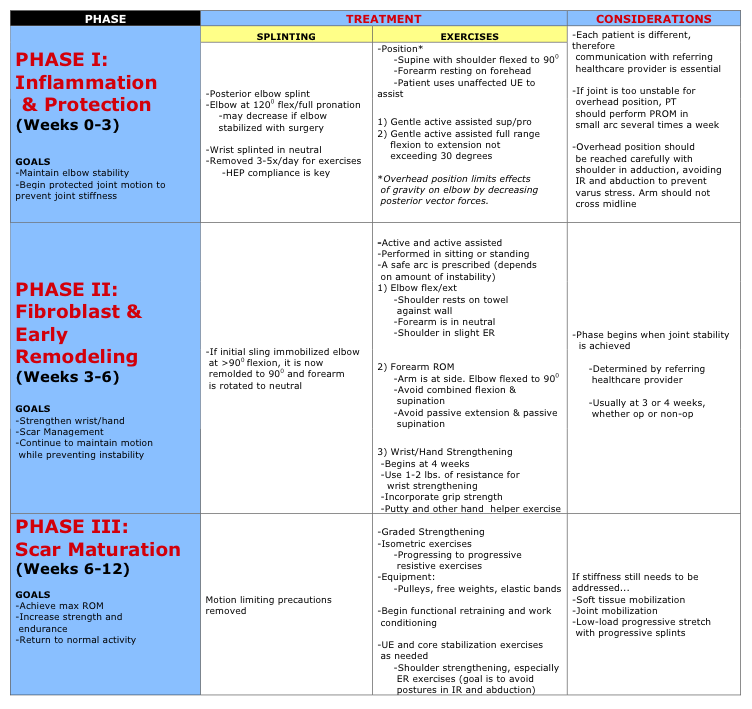 The period of immobilization depends on the level of stability and can last anywhere from three to four weeks. Clinicians must keep in mind that the longer the elbow is immobilized, the greater risk there is for adhesions and flexion contractures. After 10-14 days of immobilization in a posterior splint or cast, a hinged splint with an extension block is used. Mobilization should begin within a few days after the injury and must be protected and supervised. Early on, patients can safely begin active and passive mobilization with the use of a brace and the forearm in full pronation. Patients with PLRI should avoid placing the arm in abduction or internal rotation while performing elbow flexion and extension range of motion exercises. Supination of the ulna away from the humerus is the main cause of instability. Therefore, treatment should be aimed at ensuring that the stabilizers of the humeroulnar joint are efficient. Muscle activity is a significant contributer to poterolateral stability of the elbow. The brachialis, brachioradialis, biceps, and triceps all act to compress joint surfaces together. Strengthening is a key component to increase stability in the lateral ulnar collateral ligament deficient elbow. However, evidence is lacking regarding how the strengthening of these muscles directly reduces instability. A randomized controlled trial by Ocarino et al., found that strengthening the elbow flexors throughout full range of motion significantly increased elbow stiffness compared to strengthening in a limited range. The authors also determined that both ranges of strengthening significantly modified the elbow’s resting position to a greater degree of flexion. This last finding is especially significant, as a fully extended position of the elbow leaves the lateral ligaments most vulnerable to instability. 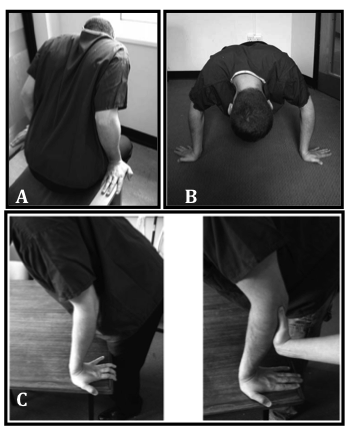 Clinicians must consider each patient’s presentation and fine-tune their treatment in order to achieve the ideal balance of elbow stability and mobility. Table 3. PLRI Conservative Treatment. Chart created using protocol from: Wolff AL, Hotchkiss RN. Lateral elbow instability: nonoperative, operative, and postoperative management. Journal of Hand Therapy. 2006;19(2):238-245. Other clinicians have published case studies with detailed descriptions of conservative treatment specific to a certain patient. An example of a much more aggressive rehabilitation program for an athlete who sustained a grade 2 posterolateral dislocation is described by Uhl et al. The patient was a 21-year-old Division I intercollegiate football player who sustained a grade 2 posteroloateral elbow dislocation during a game. An MRI showed a partial rupture of the LUCL and an intact MCL. After an aggressive rehabilitation program, the athlete was able to return to full sports activities in only three weeks. His treatment began with pain free active range of motion and cold whirpool twice a day. Elbow and shoulder resistive exercises began at just 6 days after injury. By the 9th day, the athlete began bouncing a basketball against a wall with both hands for proprioception and endurance training. He also began sports specific drills in a pool at this time. All exercises continued to be progressed, and the patient was able to fully participate in a football game 3 weeks after the injury. He continued to play football with no recurrent injuries for his last two seasons. At this point, the athlete was re-evaluated a final time. He had full elbow range of motion, strength, and function. He only reported minimal discomfort at times. However, he was apprehensive during a lateral pivot shift test. Laxity was not found, but the apprehension suggested that the LUCL may still have residual deficiency. Taping plus bracing increased stabilization while athlete was able to perform sports specific training. Highly motivated and compliant athlete and good communication between athlete and rehab team. Low-level evidence exists regarding the physical therapy treatment of PLRI. Therapists must utilize clinical judgment and treat each case individually. Rehab must be guided by each patient's unique case of PLRI, taking into consideration their goals and previous level of activity. Determining the perfect stability/mobility ratio and adjusting rehabilitation programs accordingly will be one of the most challenging aspects of treating this condition. Proficient communication with referring health care providers is essential, and a thorough understanding of the anatomy and biomechanics surrounding the condition is required. Using these tools, plus the available evidence, clinicians can successfully treat existing posterolateral rotary elbow instability and prevent the occurrence of it following elbow dislocation. Repair and augmentation of the lateral collateral ligament complex using internal bracing in dislocations and fracture dislocations of the elbow restores stability and allows early rehabilitation. ↑ 1.0 1.1 1.2 1.3 1.4 1.5 O’Driscoll SW, Bell DF, Morrey BF. Posterolateral rotatory instability of the elbow. J Bone Joint Surg Am. 1991;73:440-446. ↑ 2.0 2.1 Sanchez-Sotelo J, Morrey BF, O’Driscoll SW. Ligamentous repair and reconstruction for posterolateral rotatory instability of the elbow. J Bone Joint Surg (Br). 2005;87(1):54-61. ↑ 3.00 3.01 3.02 3.03 3.04 3.05 3.06 3.07 3.08 3.09 3.10 3.11 3.12 3.13 3.14 3.15 3.16 3.17 3.18 3.19 Charalambous CP, Stanley JK. Posterolateral rotatory instability of the elbow. J Bone Joint Surg (Br). 2008;90:272-279. ↑ 4.0 4.1 4.2 Dunning CE, Zarzour ZDS, Patterson SD, Johnson JA, King GJW. Ligamentous stabilizers against posterolateral rotatory instability of the elbow. J Bone Joint Surg Am. 2001;83:1823-1828. ↑ 5.00 5.01 5.02 5.03 5.04 5.05 5.06 5.07 5.08 5.09 5.10 5.11 5.12 5.13 5.14 5.15 5.16 5.17 5.18 5.19 5.20 5.21 5.22 Murthi AM, Keener JD, Armstrong AD, Getz CL. 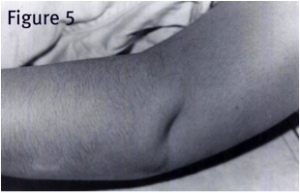 The recurrent unstable elbow: diagnosis and treatment. J Bone Joint Surg Am. 2010;92;1794-1804. ↑ 6.0 6.1 6.2 6.3 6.4 6.5 6.6 6.7 6.8 Savoie FH, Field LD, Ramsey JR. Posterolateral rotatory instability of the elbow: diagnosis and management. Oper Tech Sports Med. 2006;14:81-85. ↑ 7.0 7.1 7.2 7.3 7.4 7.5 Muller MS, Drakos MC, Feeley B, Barnes R, Warren RF. Nonoperative management of complete lateral elbow ligamentous disruption in an NFL player: a case report. HSSJ. 2010;6:12-25. ↑ Johnston J, Plancher KD, Hawkins RJ. Elbow injuries to the throwing athlete. Clinics in Sports Medicine. 1996;15(2):307-329. ↑ 9.00 9.01 9.02 9.03 9.04 9.05 9.06 9.07 9.08 9.09 9.10 9.11 9.12 9.13 9.14 9.15 Bell S. Elbow instability, mechanism and management. Current Orthopaedics. 2008;22:90-103. ↑ 10.0 10.1 10.2 10.3 10.4 10.5 10.6 10.7 10.8 O’Driscoll SWM. Elbow instability. Acta Orthopaedica Belgica. 1999;65(4):404-415. ↑ 11.0 11.1 11.2 11.3 11.4 Eygendaal D. Ligamentous reconstruction around the elbow using triceps tendon. Acta Orthop Scand. 2004;75(5):516-523. ↑ 12.0 12.1 12.2 12.3 12.4 12.5 12.6 12.7 12.8 12.9 Hickey DG, Loebenberg MI. Elbow instability. Bulletin of the NYU Hospital for Joint Diseases. 2006;64(3,4):166-171. ↑ 13.0 13.1 O’Driscoll SW, Morrey BF, Korinek S, An K-N. Elbow subluxation and dislocation: a spectrum of instability. Clinical Orthopaedics and Related Research. 1992;280:186-197. ↑ Bredella MA, Tirman PFJ, Fritz RC, Feller JF, Wischer TK, Genant HK. MR imaging findings of lateral ulnar collateral ligament abnormalities in patients with lateral epicondylitis. AJR. 1999;173:1379-1382. ↑ 17.0 17.1 Vrettos BC. A clinical approach to chronic injuries of the elbow. International SportMed Journal. 2005;6(2):64-83. ↑ Jeon I-H, Micic ID, Yamamoto N, Morrey BF. Osborne-cotterill lesion: an osseous defect of the capitellum associated with instability of the elbow. AJR. 2008;191:1727-1729. ↑ Olsen BS, Sojbjerg JO. The treatment of recurrent posterolateral instability of the elbow. J Bone Joint Surg (Br). 2003;85:342-346. ↑ 23.0 23.1 23.2 23.3 23.4 Uhl TL, Gould M, Gieck JH. Rehabilitation after posterolateral dislocation of the elbow in a collegiate football player: a case report. Journal of Athletic Training. 2000;35(1):108-110. ↑ 24.0 24.1 24.2 24.3 24.4 24.5 Wolff AL, Hotchkiss RN. Lateral elbow instability: nonoperative, operative, and postoperative management. Journal of Hand Therapy. 2006;19(2):238-245. ↑ 25.0 25.1 Ocarino JM, Fonseca ST, Silva PLP, Mancini MC, Goncalves GGP. Alterations of stiffness and resting position of the elbow joint following flexors resistance training. Manual Therapy. 2008:13;411-418.